When do you feel the least attractive? If we had to narrow it down, we'd say it's probably be when we huffing through an airport, dragging our luggage — and our stress — with us. Try as we might to be organized, pulled-together travelers, the our flying-the-friendly skies reality is usually makeup-free, sweaty, and wearing regrettable footwear. As if Benefit could sense our travel-induced malaise, the always-adorable beauty brand has launched new retail concept: these adorable "Glam Up & Away!" kiosks, which recently launched at JFK and will soon be available in 25 airports including Las Vegas, Houston, Austin, Savannah, and Cleveland. 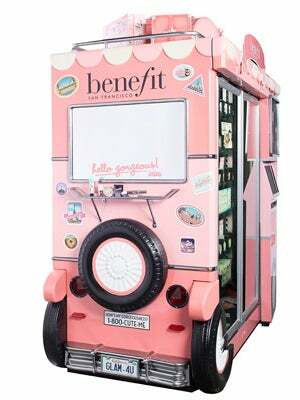 These cheery, pink little buses are the cutest things on four wheels — and provide the perfect products for quick pre- or post-plane beauty fixes. After all, what could be better after an overnight sclep than a little Ooh La Lift?